From time to time, Outlook may mistakenly report recipients as having invalid email addresses, although their email addresses are clearly valid. In this article we try to offer some solutions to this “invalid email address” Outlook error. As you probably know, when you forward or reply to an email in Outlook, it preserves the format (plain text or HTML) of the original message. However, for styling reasons, many of us prefer to use the HTML format. This article shows how to always reply or forward emails in HTML format using Outlook 2003 – 2013 and the Bells & Whistles add-in. For obvious reasons, most business emails include a signature image with a hyperlink on it. In this article, we will explain how to create an Outlook signature image with hyperlink that gets automatically inserted in your outgoing emails. We will use Outlook 2013 to illustrate this tutorial, but similar steps to add hyperlinks on email signatures apply to earlier Outlook versions, too. Did you click on the above picture to enlarge it? 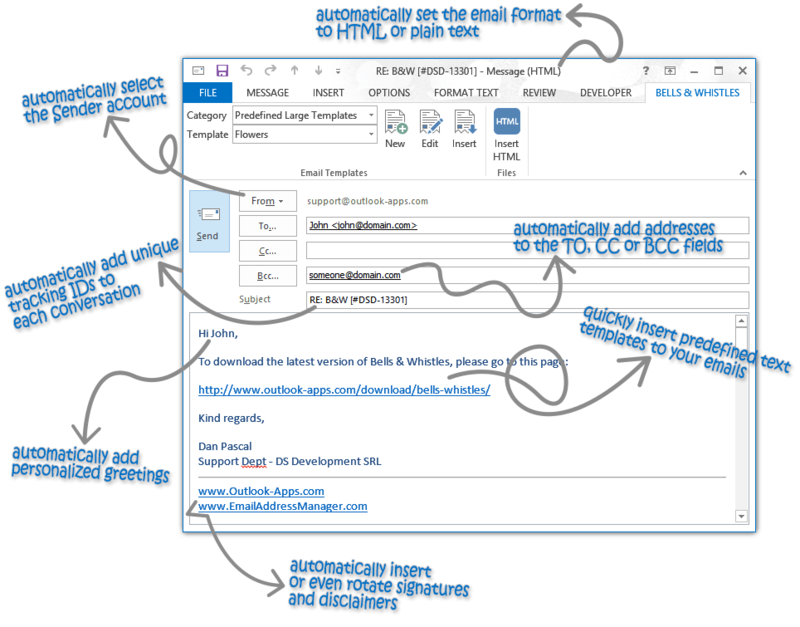 All these email automation actions can be performed in Outlook using the Bells & Whistles add-in. And even more! Unfortunately, dealing with Outlook duplicate emails is a common frustration. For various reasons, we all end up having to deal with lots of duplicated emails, but removing them can be a very time consuming task, if done manually. In this article we will detail how to automatically remove Outlook duplicate emails using Weight Diet, an Outlook optimization add-in designed to remove duplicate and obsolete items from Outlook mailboxes. As you probably know, when you reply or forward an email, Outlook automatically sets your “From” address as the one being used in the initial replied/forwarded Outlook email, no matter which is your default Outlook email account. It can be a frustrating process to always manually change the account to send from… On this article we will detail how to always send emails from one / default account in Outlook. Easy Mail Merge is an Outlook add-in designed to compose and send mass customized emails from Outlook. This articles answers the most frequent mail merge errors reported by Easy Mail Merge users. These issues are grouped in two categories: errors reported when composing & generating the mail merge emails and issues encountered while sending the mail merge emails from Outlook. Starting with version 5, Bells & Whistles for Outlook includes a comprehensive email statistics software engine that allows you to create reports (email metrics) about your Outlook email activity. On this article we will detail these email statistics features. This article details the unique Outlook Send Options available for your mail merge campaigns created with Easy Mail Merge. These send options work with any Outlook version, including Outlook 2013.